The distinct black and white stripes of the zebra (Equus spp.) are a widely recognized symbol of the savannah. Zebras were once found throughout Africa, but their current geographic distribution is only a fraction of what it once was. Zebras fill vital niches in ecosystems across the continent. Common zebras (Equus burchellii), also known as plains zebras and Burchell's zebras, are the most populous of the three species by far. These residents of the savannah are a common sight on the Serengeti-Mara plains of Kenya and Tanzania. It's estimated that more than 700,000 individual common zebras live in the wild, a number that dwarfs the populations of the other zebra species. Their range extends north into Ethiopia and as far south as South Africa. Significant populations exist in several countries, including Namibia, Uganda and Rwanda. Common zebras prefer the plains and other open grassland habitats, although they are occasionally found in wooded or rough terrain. While the native range of Grevy's zebras (Equus grevyi) once extended over a large swath of the African continent, they are now found only in a few select regions of southern Ethiopia and northern Kenya, according to Animal Diversity Web. In the past, the species thrived throughout these two countries as well as areas of Somalia and Djibouti. They favor open grasslands like the common zebra, although they are less reliant on local water supplies and can tolerate more arid climates than their relatives. 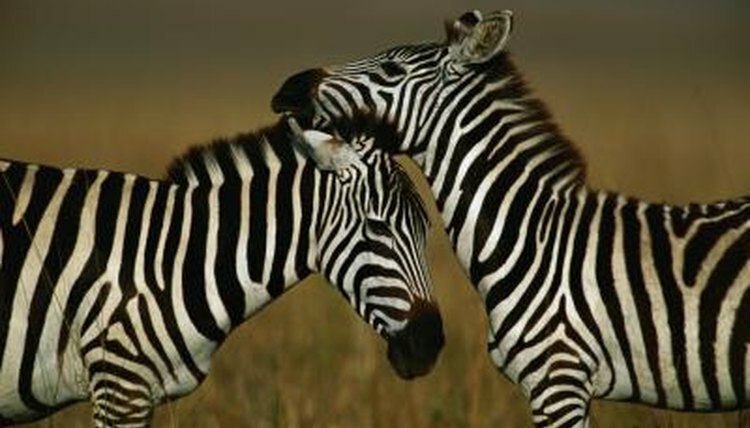 This makes them an important addition to the local ecosystem, as they graze in areas that plains zebras normally avoid. Mountain zebras (Equus zebra) are classified into two subspecies, Hartmann's mountain zebras and Cape mountain zebras. The Cape subspecies exists only in a small region of South Africa, while small populations of Hartmann's zebras are scattered across an area that stretches from Southwest Africa to the edge of Angola. Researchers estimate that 600 to 700 Cape zebras live in the wild and only 1,000 to 1,300 Hartmann's zebras, according to Defenders of Wildlife. Both subspecies prefer rough, elevated terrain, although the Hartmann's variant dwells in more arid habitats. While plains zebras enjoy the security of a larger population and wider distribution than the other species, all wild zebras face the inevitable threat of habitat loss. As human civilization develops and expands across Africa, populations are forced to scatter and migrate to less favorable locations. Some ecologists cite the influx of cattle ranchers as a leading cause of zebra decline, as they compete with wildlife for limited water supplies. Hunters pursue zebras for their pelts. Fragmentation of zebra populations contributes to poor genetic diversity, which further hinders the animals' ability to adapt to changing environments.